The 9-inch Nook HD+ is Barnes & Noble's first full size tablet. A 7-inch Nook HD will also begin shipping in October. The tablet field is one of tech's hottest battlegrounds, with new players and new devices popping up every week. The latest is Barnes & Noble's new Nook HD line, which offers beefed-up hardware and a new 9-inch tablet size. New features include a Nook Video streaming service, a "scrapbook" feature that lets users save content like magazine pages, and the option to create device profiles for different family members. The Nook HD line runs on Google's (GOOG) Android operating system, and its homescreen design is much more streamlined than that of the previous Nook tablet. Barnes & Noble (BKS) took shots at two of its main tablet rivals, Apple and Amazon, in its press release announcing the HD line: "[The HD+ is] nearly half the cost of the leading large-format tablet, [and] both products deliver an amazing value for customers, with no annoying ads." Barnes & Noble has fallen behind both rivals. Apple captured more than two-thirds of the tablet market in the second quarter, according to iSuppli's most recent data. Amazon took the No. 3 spot, behind Samsung, with 4%. Barnes & Noble came in at No.5 with 2%. "No one can ignore what Apple does," Barnes & Noble CEO William Lynch told CNNMoney this week. But at a pre-announcement demo with journalists in New York City on Monday, it was clear that Barnes & Noble is aiming squarely at Amazon's Kindle Fire -- especially the newly announced and similarly named Kindle Fire HD. Staffers used the Fire to extol Nook's virtues, setting up side-by-side comparisons on screen, size and weight: "See how [Fire] casts a sort of shadow over the screen?" "Feel how much heavier and wider [the Fire] is," another suggested. "It's much tougher to hold." Lynch took his own shot at Amazon. 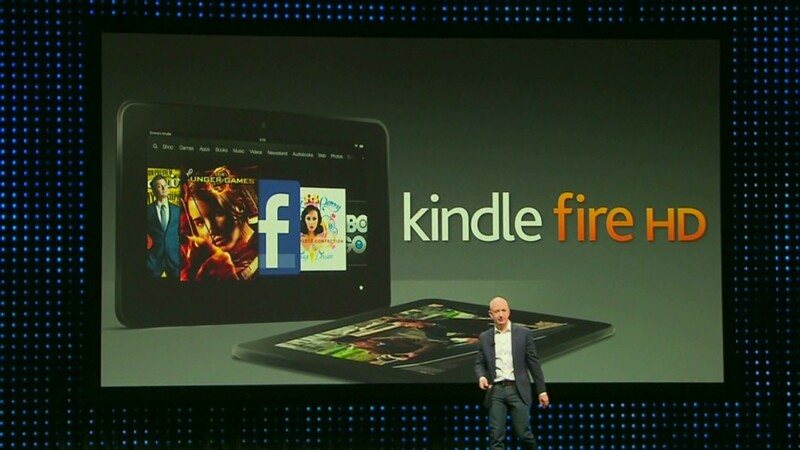 "Jeff [Bezos, Amazon's CEO] says the Kindle Fire is the best media tablet at any price, which is a joke given the specs," he said. Barnes & Noble aimed to improve those specs with its own Nook HD. At first glance, the most obvious enhancement over the older Nook line is the HD's crisper screen. The 7-inch Nook HD features a screen resolution of 1440 x 900 and supports 720p video; Barnes & Noble says that's 25% more pixels than the Kindle Fire HD. The 9-inch version of the new Nook is 1920 x 1280 (which falls short of the iPad's resolution) and plays 1080p video. To take advantage of the improved screen resolution, Barnes & Noble is launching Nook Video. Users can buy or stream content in either HD or standard definition, and a representative said the prices will be "comparable" to other a la carte services. Nook Video will also be available as an app for use across several devices. 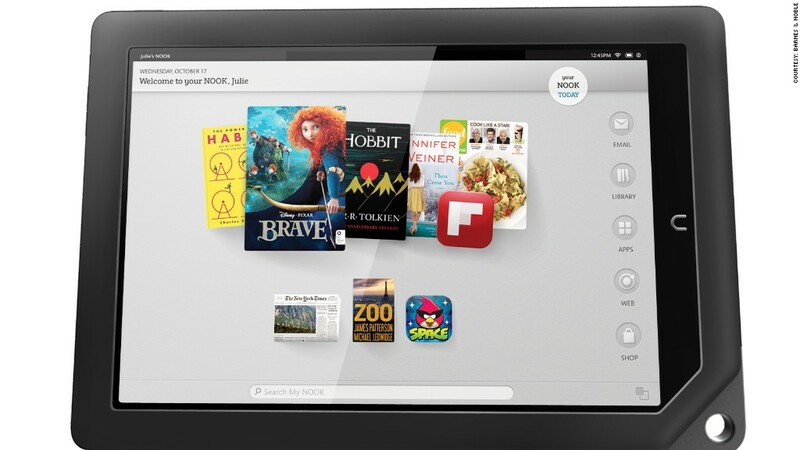 As before, the Nook HD features a "curated" app store and access to Barnes & Noble's catalog of more than 3 million books. The 7-inch Nook HD weighs 11.1 ounces, and the 9-inch model is about 7 ounces more. Each supports microSD card expansion up to 64 GB. Unlike many of its rivals, the Nook HD doesn't have a camera. Lynch shrugged that off in this week's demo. "When you're making a device light and inexpensive, you have to make decisions," he said. "We felt like 99.9% of people who own a tablet will have a smartphone in their pocket with a better camera." Lynch also talked up Barnes & Noble's retail advantage: It can display the Nook HD in its 700 bookstores and at several stores owned by its big-box retail partners like Best Buy (BBY), Target (TGT) and Wal-Mart (WMT). Amazon, on the other hand, has tons of website traffic but doesn't own any bricks-and-mortar stores. Target and Wal-Mart recently announced they won't sell Amazon Kindles anymore. Barnes & Noble may have Amazon squarely in its crosshairs, but Amazon and Apple aren't the only tablet makers in town. Samsung is comfortably ensconced in the No. 2 tablet market spot, and Google began shipping its Nexus 7 earlier this summer. Microsoft is pushing the Windows 8 on its own Surface tablet, and several of its hardware partners are expected to create devices that run on the Windows 8 operating system.